Florida Farm Animal Rescue View other Farm Animals for adoption. 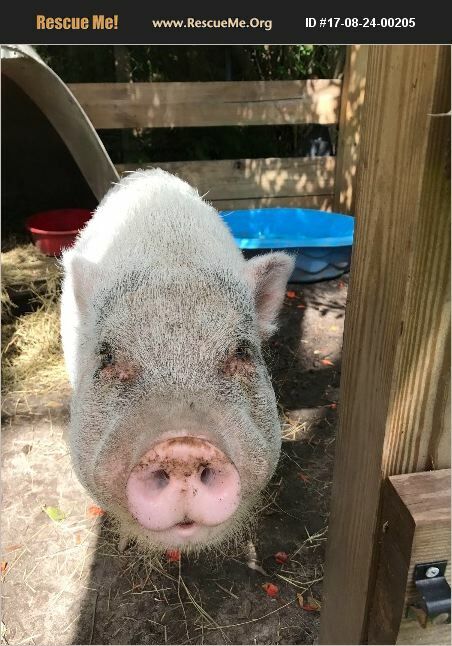 Bubba blue is a happy loveable piggy. He is very smart and spends his days outdoors he is neutered and has also had his tusk filed once. He has never been around other pigs but he has been socialized with dogs and cats he can be grumpy when the dogs come around his house. Bubba lives in a wooden cage with an igloo and a pool. He loves to have his hay replaced and eats once a day and hangs out in his pool when he's hot I pay $11.00 max for his food and hay every couple months. He is very smart and will do tricks for food. He sits gives kisses,hugs,and goes in his cage when told to do so. He is potty trained and will not pee or poop in his enclosure. He doesn't need much maintenance just a loving family and occasional belly rubs. I am moving in 8 months and need to find him a loving home with a family that will keep me updated about his status as send pictures . I love my piggy dearly but I can not take him with me. If you are interested please feell free to ask any questions. Am willing to break down and rebuild his enclosure if necessary. Thank You!! !